Explore Great Barrier Reef to Sydney with Ayer's Rock. Add Melbourne as a pre-tour experience. Depart Your Home Airport on your Trans-Pacific flight to Australia ~ Flight not included, but inquire for the special fare with our Air Service. Please Note: "Day 1" is the published tour date and is the date you will arrange your air travel to depart your home airport. Your Small Group Tour will commence on Itinerary Day 3 (Day 2 is lost crossing the international dateline) upon arrival into Ayer's Rock, Australia (airport code: AYQ). This day will be "lost" as we cross the International Dateline. We will regain this day on our return. All guests will enjoy a wonderful dinner in Australia. Orientation Walkabout: At 4:00 pm, join your Tour Captain for an Orientation Walkabout of the Resort. Join your Tour Captain for our included Welcome Dinner at Ayer's Rock Resort — this is truly one of the most beautiful places in the world — welcome to Australia! Our approach to dining is truly unique: Our favorites dishes represent the region we're traveling through. From our unique, off-the-beaten-path restaurants we visit for each included dinner to the variety of hand-crafted dishes, it's truly an immersion into authentic local food and wine. Your Tour Captain / Story Local Host® is there to make sure your dining experience goes smoothly and will help you interpret any menu item. For most included dinners, your Tour Captain will select a variety of appetizers, featuring regional cuisine, and will select your wine for the evening ~ a variety of red and white wine from the region you're traveling ~ and yes, "the wine flows." Certain dining experiences will feature designed menus and experiences. Tonight is an intentionally slow evening of delight so you can savor the experience and breathe deeply in the very heart of Australia. Super Budget Travelers - inquire about how to upgrade to include our special dining package for the balance of your itinerary: 1-877-865-6711.
star icon Story Exclusive: Sounds of Silence Dinner. Super Budget Travelers: Opt to add this fantastic experience. This morning you will meet Australia's Aboriginal people, learn to paint Outback-style, taste fair-dink (genuine) bush tucker and experience a rare glimpse into the indigenous way of life that has carried on for thousands of years. Tonight: Unique Perspective Experience: The Award-Winning Sounds Of Silence: Field Of Light dinner under the Southern Hemisphere with Camel Riding Tour. Prior to sundown, we will transfer to the Uluru Camel Farm for a meandering tour through red sand dunes on your friendly camel with Uluru and Kata Tjuta as the incredible backdrop. Meanwhile, our experienced cameleer describes the unique flora and fauna of the landscape you are exploring. As the peaceful ride comes to a close, we are greeted with sparkling wine as our arrival at the sand dune viewing platform kicks off ‘A Night at Field of Light' experience. Select your dining choices from the A Night at Field of Light menu. This experience will last about 5.5 hours including 45min camel ride and transfers. You may opt-out of this evening's dining experience for a credit if you so desire but we heavily recommend experiencing this once-in-a-lifetime tour. Your journey begins on a lone sand dune. A path takes you to an uninterrupted, three hundred and sixty-degree view of this vast landscape. In front of you is the fabled Uluru; behind you are the domes of Kata Tjuta and, possibly the most spectacular sunset and evening sky you have ever seen. But that's not all...enjoy the magical "field of Light" presentation. Super Budget Travelers: Opt to add tonight's dining experience. At dawn, we arrive the literal "Red Center of Australia." Get ready for something, unlike anything you've experienced from the Rock to the Southern Hemisphere. We depart before sunrise for Ayer's Rock, Uluru to the Aboriginal people. Enjoy an impressive display of color as the sun rises. It's a brisk morning, but well worth it to experience Ayer's Rock up close with its own brilliant display of colors. Enjoy a continental breakfast in a brown paper bag this morning as we navigate to the Rock. Then, an optional climbing of Ayer's Rock may be in order, or simply watching. Note, climbing the rock is potentially hazardous and you will do so at your own risk. You may opt to climb the world's largest monolith, but be warned: Many have tried and succeeded, while a few have failed and gave up their lives. Do you have medical conditions that may inhibit you from climbing Ayer's Rock? Then we suggest you enjoy a lovely walk around the base of the rock with your Tour Captain. Absolutely stunning. After our experience at the Rock, we then continue to the airport and our onward flight to Queensland. Welcome to Tropical Far North Queensland. Welcome to Cairns, where the rainforest meets the reef. Upon arrival, we transfer to our hotel and freshen up before a Queensland welcome dinner with your Tour Captain. Queenslander, now Story Land & Sea, Tours' name was inspired as a result of the adventures our founder experienced while exploring Queensland's natural beauty and delightful people. After breakfast, on our first full day in Queensland, we are all off to see the Great Barrier Reef up close. This is one of the most stunning experiences on our tour and we enjoy it from our private boat. Today, enjoy a full-day tour of the Great Barrier Reef - complete with glass bottom boats and snorkeling - get up close to the Technicolor banks of coral reef teeming with tropical fish. This experience is one which makes a lasting impression on Story Land & Sea patrons - if, at all possible, you must try snorkeling on the Great Barrier Reef. The day is highlighted with a smorgasbord lunch on the water and ample free time for relaxing and soaking in the sun. We return to our hotel for a free evening. Super Budget Travellers: Opt to add tonight's dining experience. Enjoy a completely free day in Queensland today or opt to explore the rainforest called Kuranda. Exclusives: Sunset Cruise Dinner. Super Budget Travelers: Opt to add tonight's special dining experience. Morning air flight from Cairns bound for Sydney. 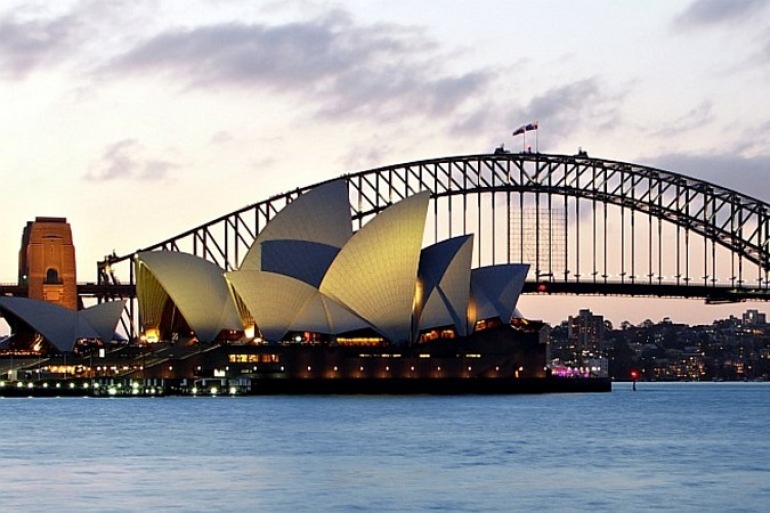 Our hotel is located on Circular Quay on beautiful Sydney Harbour. After check-in, join our Tour Captain for a walkabout of the Circular Quay and historic Rocks district. Your Tour Captain is knowledgeable on local customs, history, and shops. The historic Rocks district comes alive as you walk where the original Sydney settlers and convicts walked. After breakfast, meet the Tour Captain and then enjoy our included sightseeing experience of Sydney, Australia. From the "Rocks District" to Bondi Beach, we enjoy an immersion in everything Sydney. Sydney-Siders, as they're called, are a warm people for such a cosmopolitan city. Bondi Beach is one of the most famous beaches in the world. Enjoy a history of the Bondi Surf Bathers' Life-Saving Club before we return to the Rocks for the balance of the day free. Tonight, explore on your own for dinner or join the Tour Captain to an optional but unique, distinctly Australian dining experience. Option: Upgrade to experience The Field of Light Award-Winning Experience under the Southern Hemisphere: $425.00 per person. Option: Upgrade to experience this Story Exclusive: Reception and Dinner on our Private Boat on Sydney Harbour: $375.00 per person. See any of the mainstream tour operator itineraries to Australia and you will see very quickly how their "tour directors" make extra revenue. Customary Gratuities Included. Optional gratuities for your Tour Captain are at your discretion. Unique restaurants that are designed for discerning diners, not big tour groups. Daily Breakfast, 1 Lunch & 1 Dinner per itinerary. Our dinners are at real restaurants (not buffets at the hotels). Option: Upgrade to our Onboard Dinner on Sydney Harbour for $365 per person. Upgrade to four (4) total dinners included for $525 per person. Portage Included through your Tour except during required air flights (due to security requirements). You may have surcharges for carry-ons or overweight luggage. Our Airport Arrival Transfer into Melbourne or Ayer's Rock Resort is $69 per person, 2 guest minimum. Our Departure Airport Transfer is $59 per person, 2 guest minimum. Should you or any member of your party need to cancel your booking or any part of it once it has been confirmed, you must immediately advise us in WRITING by email or hardcopy, and you must confirm our receipt of same. Cancellation charges are payable as set out below except where otherwise stated. These charges are calculated from the date the written notice of cancellation is received by Story Land & Sea. Travel Protection Plan premiums and amendment charges are non-refundable in the event of your cancellation. Cancellations are very costly and usually do not occur in time for resale of the cancelled travel event. If cancellation in writing is received by Story Land & Sea more than 90 days prior to travel departure date (or 120 days for certain travel events), the deposit will be returned.